Speakers from March 21 women’s forum. 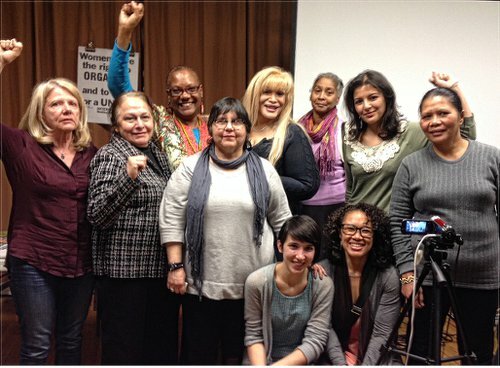 Workers World Party sponsored an extraordinary panel of women activists at its annual International Working Women’s Month forum in New York City on March 21. The program was entitled “Women on the move against the 1%; Oppression of women here and worldwide = resistance and solidarity.” The women speakers connected some of their daily personal and political experiences to the general status of women living under and resisting capitalism and imperialism, including low-wage jobs, racism, sexism, transgender oppression, war, occupation and other forms of institutionalized inequality. The speakers and their organizations were Joyce Kanowitz, People with Disabilities Caucus of Workers World Party; Madison St. Claire, Strategic Trans Alliance for Radical Reform, part of the Sylvia Rivera Law Project; Rosanna Rodriguez, Laundry Workers Center; Rosa Maria de la Torre, Chelsea Coalition for Housing; Norma Capuyan, KALUMARAN: Strength of Indigenous Peoples in Mindanao, Philippines; Fatin Jarara, Al-Awda, Palestine Right to Return Coalition; Brenda Stokely, Million Worker March Movement; Kaylee Knowles, Fight Imperialism, Stand Together (FIST) youth group; Teresa Gutierrez, May 1 Coalition for Worker and Immigrant Rights; and Sharon Black, Baltimore “We Deserve Better” Workers Assembly. 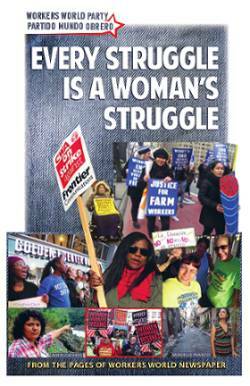 LeiLani Dowell from Workers World newspaper chaired the meeting.